Since Stephanie Nicks became “Stevie” in 1973, the ethereal songstress has recorded 18 albums, been nominated for 17 Grammys, and had one of the music industry’s most notorious love affairs — with fellow Fleetwood Mac member, Lindsey Buckingham. Yet Nicks’ latest album, In Your Dreams, released in May, marks the first time the singer/songwriter has worked with a collaborator in the songwriting process (even in Fleetwood Mac, Nicks and Buckingham wrote separately). 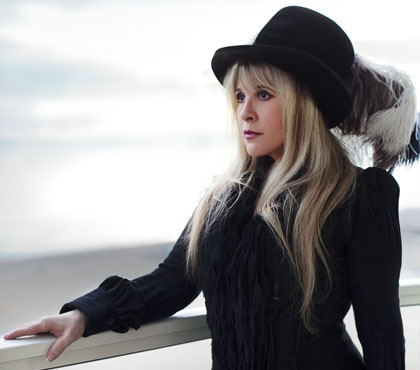 Working closely with Dave Stewart of The Eurhythmics, Nicks has produced some of her most compelling work since Bella Donna; she seldom sings as vulnerably, and her voice still has the haunting rasp that’s classic Stevie. So I was disappointed when her tour was cancelled, due to pneumonia, just several days before her live show in New York. Still, Nicks spoke to Riff City from her Los Angeles home, where she recorded In Your Dreams. Her smoky contralto was instantly recognizable — and in no need of auto-tune — as she offered her thoughts on the creative process, the new LP, and why she doesn’t plan to retire anytime soon. Riff City: Congratulations on your album. It’s beautiful. Stevie Nicks : Thank you. RC: I was disappointed that you cancelled your East Coast tour. Tell me, Do you still enjoy touring? SN: If I didn’t enjoy it, I wouldn’t do it. I would be insane if I was stuck in Las Vegas for two and a half years, doing a show in a hotel. That would be my nightmare. You go [on tour] and sometimes you end up two days and sometimes three days, in an out-of-the-way city you’d never imagine you’d be in, and then you come back! I’ve been touring since 1975. We do the show, we change, we take our makeup off, I get my purse, and we go to the airport and get on a plane and fly to the next city, and then we wake up in that next city. I like to just get there because I stay up late anyway. I don’t go to bed until three or four. Now, is it tiresome? Is it tiring? Yes. If I stopped touring would I be totally bored? Probably. RC: What was the longest period of time you spent not touring? SN: This year. We got off the road from 83 shows with Fleetwood Mac. The last show was December 21st in New Zealand. I started my record in February 2010 and finished in December. So I was home in my house for almost a year, but we were working almost seven days a week. It was really exciting; we turned the whole two-story house into a recording studio, which is a room within a room with bad air and no windows. I don’t really lie around very much because I never have. And when I have nothing to do, I feel creepy. I’m happy to be working. I think when you don’t work, when you retire, you just get small. RC: Can you tell me about your process, when writing new music and when you were working on this album? SN: You can be walking down the street, and see someone that catches your eye, and say, “Gosh! That was a gorgeous man,” and something touches you, and you might go home and write a poem about that, you know? SN: Or you go to Italy, which I did on the Fleetwood Mac tour. I was there for four weeks, and I wrote the song “Italian Summer,” and it sounds like I wrote it about a big love affair, but I didn’t. I wrote it about Italy, walking around on the cobblestone streets and feeling free and feeling safe. So you can be inspired by anything. If you happen to be in a crummy hotel room, which I actually never am… I’m usually in beautiful hotel rooms! So you go back to your beautiful hotel room and write a great poem, and maybe there’s a piano and you can put it to music. Or, you can be in your house, or in a car, driving to San Diego for two hours and think of something and get paper and pencil. People who schedule writing dates and say, ”Okay I’m going to sit down and write with this person from 2 to 3 and then 4 to 6, and then I’ll have dinner and work from 9 until…” Well, I just could never do that. RC: But what about when you were working on this album? Weren’t you collaborating? SN: I started working from the very beginning with Dave Stewart. He and I sat down and wrote songs together, which is something I have never done. Not with Lindsey, not with anybody. I think it’s because Dave is the kind of guy that has no ego and could read a face. So when we would start working on something and if I didn’t like something, he could see it in my eyes, before I even realized it. And we would say “Okay, lets start again!” So the first day, he came up here, and we wrote a song and my world changed. I really understood why Lennon and McCartney wrote together when they really didn’t have to or why Roger and Hammerstein wrote together… You bring something to the table, they bring something to the table. You can spend a year and a half or two years trying to write a song. You can sit at the piano and suffer away and cry and you know, go through your booklets of poetry for days and never come up with anything. With Dave, we were on a roll and the album came very fast. Dave has lots of chords, I have lots and lots of poetry. However, Lindsey has lots and lots of chords, and I have lots of poetry, but we never wrote songs together! Dave has chords, I have poetry, and we wrote seven songs in not quite three months which is major. RC: Has Lindsey been supportive? Lindsey came and played at the end of the record and totally helped me do one song… We were just stumped on how to make it sound like my demo and I said, “Dave, I think we should call Lindsey.” And Lindsay came up for two days and it came out amazing. It was a very good moment, and it took us back to Buckingham-Nicks and 1973, and what we did as the two of us and how we got this whole ball rolling. RC: What do you think about newer musicians and digital tools like autotune? SN: You’re not going to be able to take it on stage. If you’re going to be a touring band, you have to be very careful you know. If you can really sing on your record and then you go out and play live and can’t sing, then you’re in a lot of trouble. The way you used to make it, you get paid nothing and you’re starving and you play little tiny gigs and learn your craft. And now people don’t really sing and they don’t really tour. I think it’s sad and it’s unfortunate for the music industry. In 20 years, there’s not going to be another Fleetwood Mac or Led Zeppelin because they don’t have time to develop.